This approach has led to the successful regulatory approval of olaparib, rucaparib, and niraparib for patients with advanced ovarian cancer. The continuing development of effective companion diagnostic testing to identify patients most likely to respond to PARP inhibition will improve the therapeutic index of this drug class in the future. Controls the repair of single-strand breaks (SSBs) in DNA through the base excision repair pathway (BER). cells deficient in BRCA 1and 2 are unable to fully utilize the HR pathway and die from accumulated unrepaired DNA breaks when exposed to PARPi. 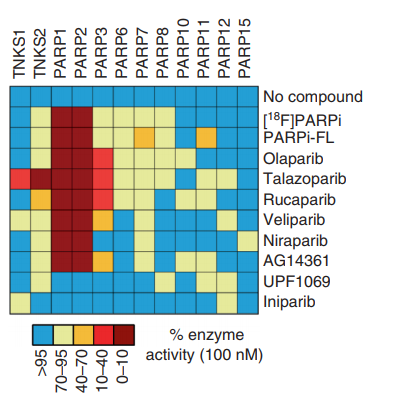 This paper the authors created new PARPi tracing molecule that can detect whether the PARP is inhibited or not, live. They did it in mouse PDX model. The model can be used to assess the likelihood of patient response before beginning treatment, based on the patient biopsy. This study was conducted by the Department of Radiology, Memorial Sloan Kettering Cancer Center, New York. And published on Nature Communications.